We’ve discussed finding your target audience, defining what your business is and what your clients want, where you want to do business, and why anyone should do business with you. 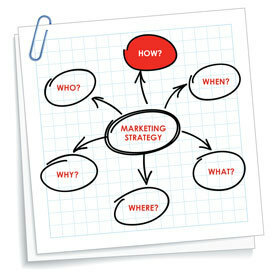 Once all of those elements have been defined and put in place, then it is time to think of the most important part of your staffing firm marketing strategy – “How” to execute your marketing strategy?How of Marketing Strategy How are you going to implement the defined who, what, when where, and why through your business? By creating a tactical execution plan, it will put your marketing strategy into context and your company’s identity will begin to take shape. The tactical execution plan should include the project, project description, resources needed, deadlines and dependencies and keep in mind prioritization. This is a key aspect of the tactical execution plan in order to convey how a marketing strategy is being constructed and executed. Your company’s logo and website reflect the face of your company and your company’s voice is developed through various social media platforms and advertising. Creating brochures, datasheet that sum up your business’ products and services, goals and objectives, and case studies all reflect your company as a brand. As part of developing a sound brand for your company, search engine optimization will be acquired through your website and social media content. Developing social media and marketing campaigns is an important factor when executing your staffing firm marketing strategy. Each campaign should be specifically targeted and you need to be persistent with the roll out of both social media and marketing campaigns, developing one each quarter in order to acquire tangible leads. Campaigns can sound overwhelming, but with a sound strategy and execution plan you can do it. Market research and analysis is important to tracking economic shifts, consumer behavior, and demographics that are all constantly changing. Research is often overlooked and yet it is one of the most important aspects to understanding, developing, and implementing elements of your staffing firm marketing strategy. Conducting focus groups and client surveys are just a few of the many ways to acquire market research. Developing press releases and building relationships with the media are all ways to implement your staffing firm marketing strategy. After defining who your target audience is, where you want to do business and your company’s goals and objectives then you can start reaching out to different media outlets in order to attain new business leads. Your tactical execution plan should define how and when you will do the projects with deadlines, dependencies, resources, etc. The tactical execution plan should address all of your marketing needs across branding, lead generation, market research and analysis, and public relations. Your plan should include metrics and tracking capabilities.